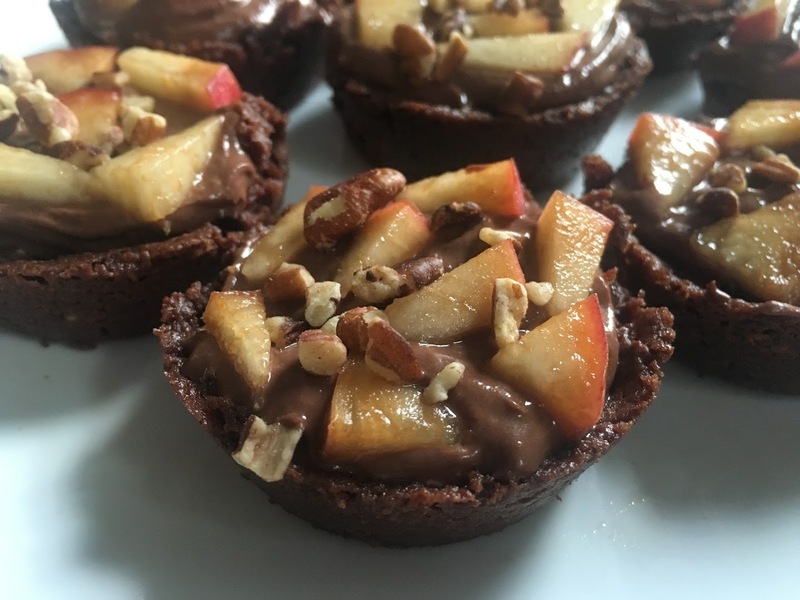 Garnished with fresh peach slices and toasted pecans, this is a summertime twist on my recipe for mini tarts with Greek yogurt mousse and chocolate shortbread crust. For the filling, which is a lighter, healthier version of chocolate mousse, I swapped Greek yogurt for quark, a yogurt-like cheese from Germany. Creamy and slightly tangy, quark cheese is absolutely delicious and can be made at home. (I purchased mine from a natural foods store.) In a pinch, use whole milk Greek yogurt. Prepare filling: Place coarsely chopped chocolate in a medium-sized, heat-proof mixing bowl. Bring milk to a boil in a small saucepan. Remove from heat and pour over chocolate pieces. Let sit for several minutes and then stir until smooth and glossy; the mixture should become the consistency of chocolate ganache. Stir in quark, vanilla, and raspberry jam until smooth. Cover with plastic wrap and refrigerate for at least an hour. Prepare crust: Preheat oven to 300 °F and lightly grease a 12-cup muffin pan with butter. In a large mixing bowl, cream together butter and sugar for a few minutes, until light, fluffy, and smooth. Stir in salt, flour, and cocoa powder until just combined. Stir in pecans. Divide dough into 12 equal pieces. Press each piece of dough evenly into the bottom of a muffin cup, and around halfway up the sides. Bake for 15-17 minutes, until set. Let cool for at least five minutes and then remove tart crusts from pan. Set aside to cool completely. Assemble tarts: Fill each tart crust nearly to the top with mousse. Thinly slice the peach, and cut each slice into small triangles. Arrange the triangles in a circular pattern over the surface of each tart and sprinkle lightly with pecans and a pinch of sea salt. Store tarts in the refrigerator in an airtight container; they will be even more delicious after sitting in the fridge for a day.